We just received a shipment of these pens and began photographing them. They look really good in person. Esterbrook dealers should have these pens in stock now. These pens have been selling well and have a lot of color choices, so let's see yours! 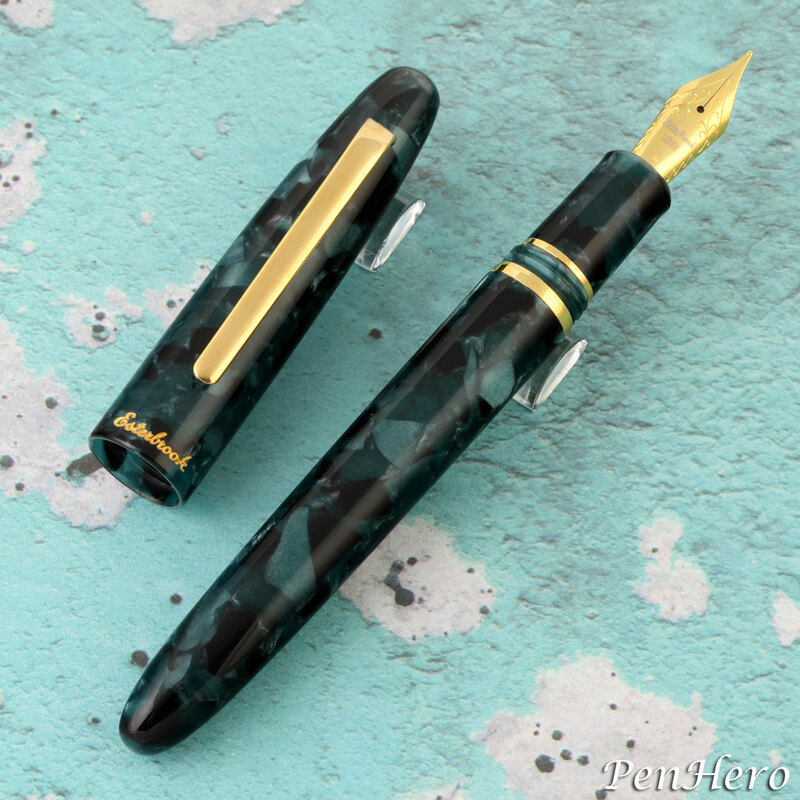 This is the new Esterbrook Estie Evergreen with gold plate trim fountain pen. It's 5.9 inches long and features a gold plated #6 German JOWO stainless steel nib. The cap and barrel are made from a marbled translucent polished acrylic. The cap has an interesting cushion cap closure that requires a little push while twisting it on or off. The trim is gold plated. It is a cartridge / converter type and with the addition of the MV adapter it can use vintage Esterbrook nibs. This same pen is available with chrome plated trim. Retail price is $195. 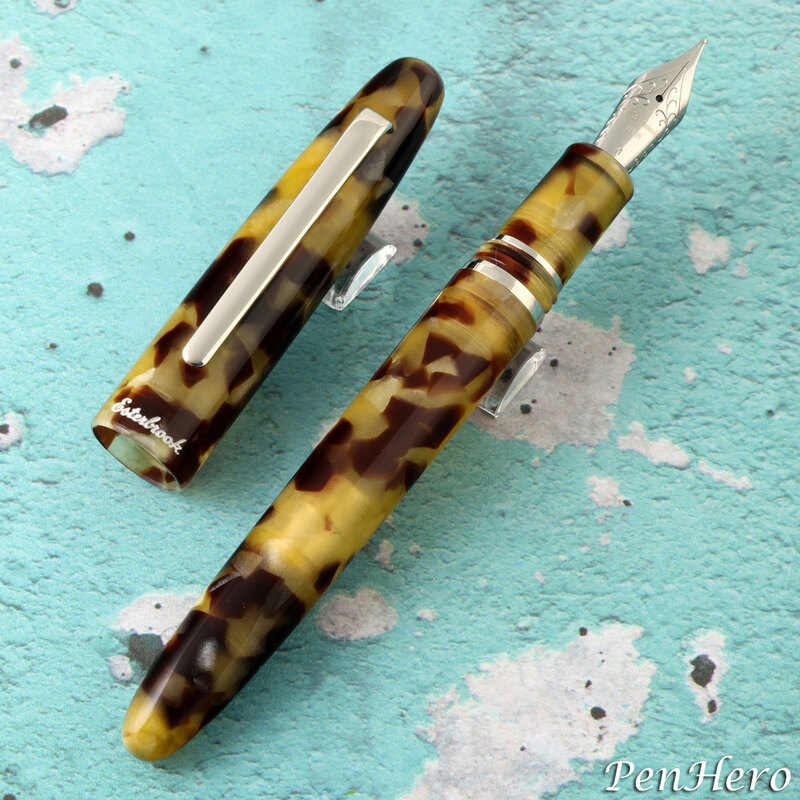 This is the new Esterbrook Estie Tortoise with silver color trim fountain pen. It's 5.9 inches long and features a #6 German JOWO stainless steel nib. The cap and barrel are made from a marbled translucent polished acrylic. The cap has an interesting cushion cap closure that requires a little push while twisting it on or off. The trim is silver color. It is a cartridge / converter type and with the addition of the MV adapter it can use vintage Esterbrook nibs. This same pen is available with gold plated trim. Retail price is $195. 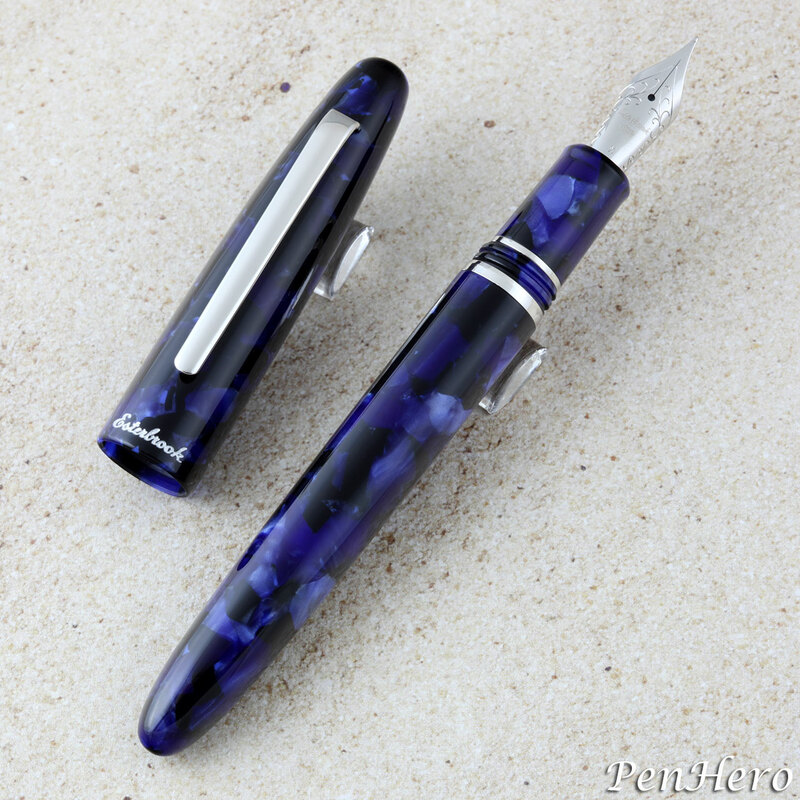 This is the new Esterbrook Estie Cobalt Blue with silver color trim fountain pen. It's 5.9 inches long and features a #6 German JOWO stainless steel nib. The cap and barrel are made from a marbled translucent polished acrylic. The cap has an interesting cushion cap closure that requires a little push while twisting it on or off. The trim is silver color. It is a cartridge / converter type and with the addition of the MV adapter it can use vintage Esterbrook nibs. This same pen is available with gold plated trim. Retail price is $195.